Growing your business and helping your clients get more local leads and customers is easy with ReachLocal. When you partner with us, you’ll tap into our smart technology, expert service, and over a decade of data insights to deliver your clients the results they’re looking for. Get big results without over-extending your resources. Ability to meet the online marketing needs of your clients without additional work for you. Help your clients get found in 98% of the places people search online with our ReachSearch™ solution. Build brand awareness and keep clients in front of actively searching consumers and website visitors with ReachDisplay™ and ReachRetargeting™. Increase engagement on your clients’ websites and help them boost conversions with our TotalLiveChat™ solution. Get details about the performance of your clients’ online and offline campaigns with TotalTrack®. 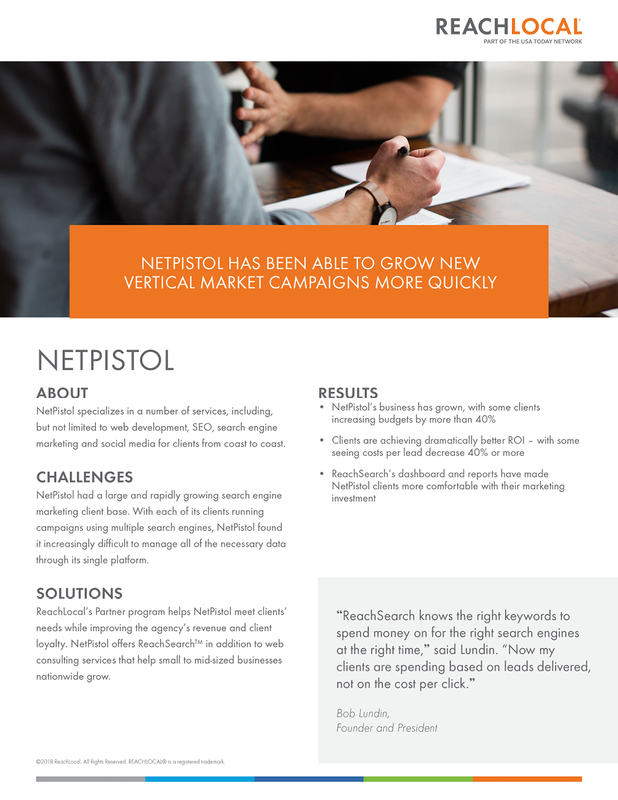 NetPistol wanted to offer a digital marketing offering for clients that would deliver results, robust reporting, and add revenue to the bottom line. ReachLocal’s Partner Program allowed NetPistol to grow their business without adding costly resources.